Card Text: ?CONT?All of your other ?Fleet Girl? characters get +1500 power. 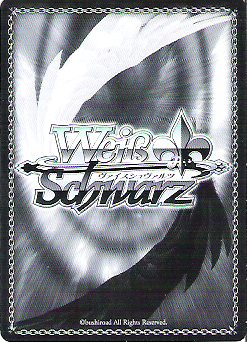 ?AUTO?When this card is placed on the stage from your hand, you may put two cards from the top of your deck underneath this card as a marker.?AUTO? [(3)] At the beginning of your opponent's attack phase, you may pay the cost. If you do, choose one of your opponent's characters, and that character gets +4 soul until end of turn. ?AUTO?At the beginning of your draw phase, put all markers underneath this card into your stock.